Wondering where to stay in Puglia? 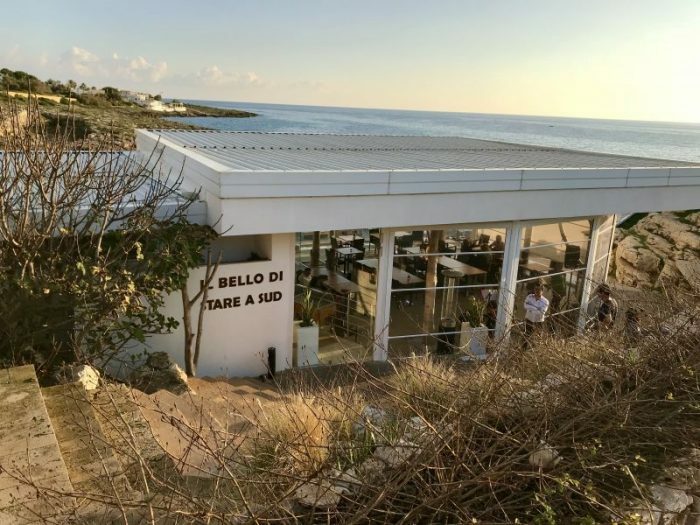 If you’re interested in regional cuisine, beautiful beaches and Baroque architecture, it’s worth considering Salento, a sunny region of Puglia in south-eastern Italy for your next European vacation. 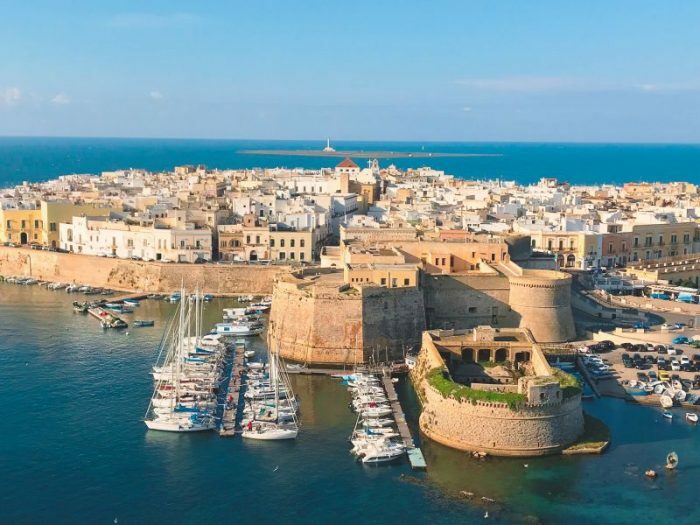 Although popular among Italians who flock to Salento’s beaches from Rome and other urban centres in the height of summer, it’s still under-the-radar for mainstream travellers. Although word is spreading about this enchanting “heel” of Italy’s boot (Madonna, Helen Mirren and Dolce & Gabbana are already fans), for now it’s blessedly free of crowds. 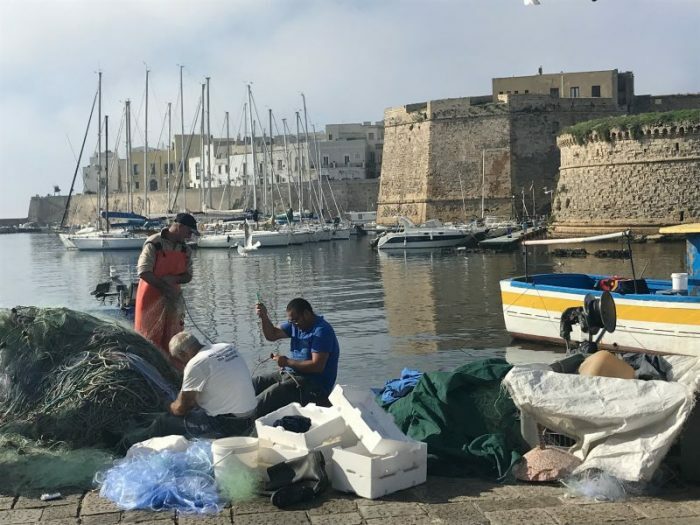 Instead of tour groups, you’re more likely to see fishermen hauling nets brimming with fish plucked fresh from the Ionian Sea. 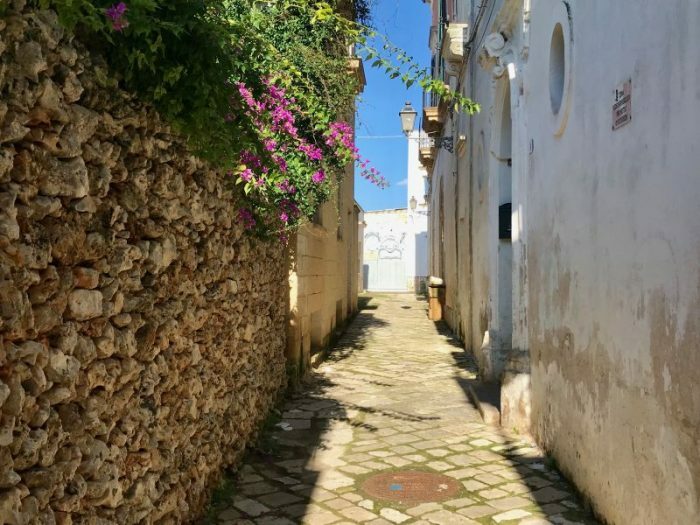 Wander the cobblestone streets of the tiny villages in the Salento region of Puglia for even a few days and you’ll soon be planning a return visit. Here’s what to see, do, eat and experience on a visit to Puglia…and why you should hurry and go now. Situated between the Adriatic and Ionian seas at the southern tip of Italy’s Puglia region, the Salento area is comprised of the province of Lecce and the southern parts of the provinces of Brindisi and Taranto. 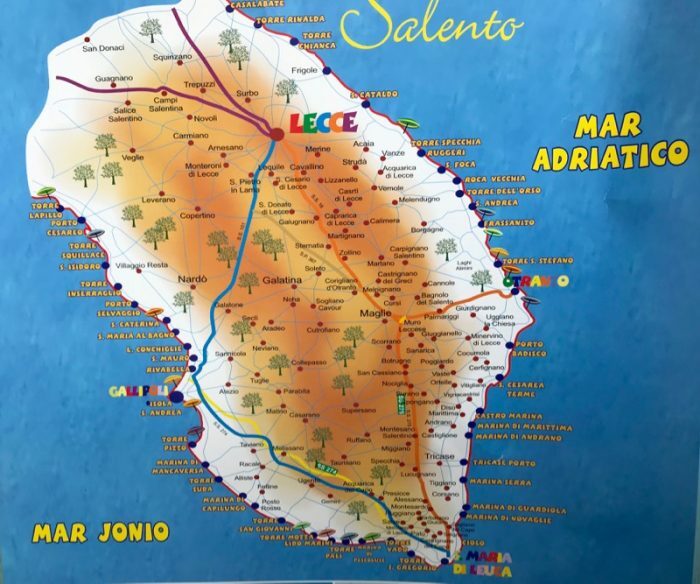 An ideal itinerary for the Salento Peninsula focuses on the Unione dei Comuni Jonica-Salentina a collection of five tiny towns within easy driving distance of the beautiful beaches of the Ionian Coast. Whether you arrive by sea, air or take the Rome to Brindisi train from Rome’s Termini Station, you’ll likely begin your explorations as I did in Brindisi, a city on the peninsula’s northeastern coast that is now home to the modern Brindisi International Airport (BDS), but has served as a gateway to the region for more than 2,000 years. This Adriatic port was once the southern point of the Appian Way, the most strategically important Roman road serving as the military and economic artery for the Roman Empire. Just south of Brindisi is Lecce, the capital of the province of Lecce. This beautiful city has been called the “Florence of the South” so if you have time it’s worth spending a week or longer taking cooking classes or studying Italian at one of its many schools. 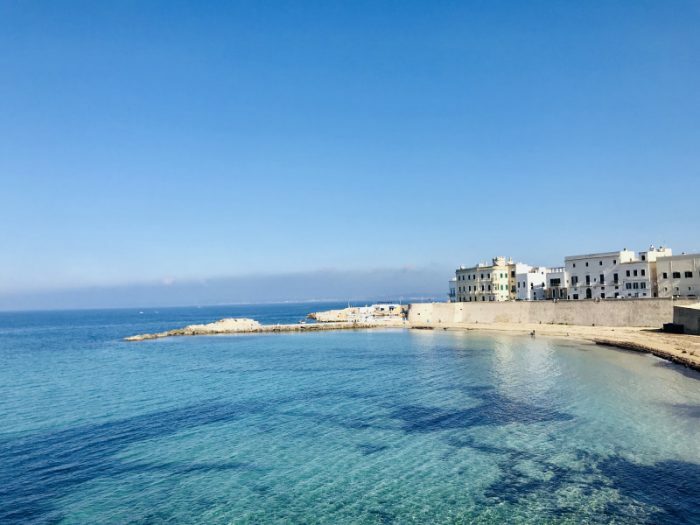 But to go off the tourist radar for a place to stay in Puglia, head west from Brindisi on the Adriatic coast to the fairytale towns of the Salento Peninsula. Here you can soak up the vibe of historic towns brimming with similar Baroque architecture without the tour groups or crowds. 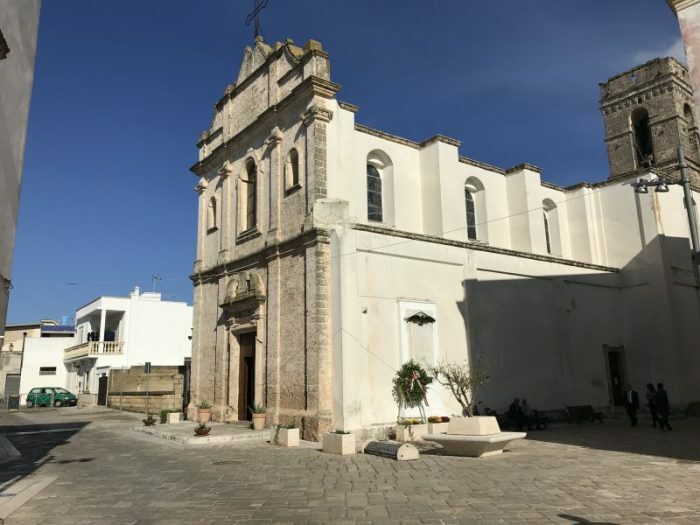 It’s a 45 minute drive from Brindisi to Gallipoli set on the Ionian Sea or an hour to one of the inland towns within the Unione dei Comuni Jonica-Salentina, a collection of five small villages filled with charm. The landscape of this section of the Salento Peninsula is much different than other regions of Italy. Unlike Tuscany where the rolling hills offer big vistas (and big crowds), the Salento is flatter, drier and less dramatic but offers its own special appeal. 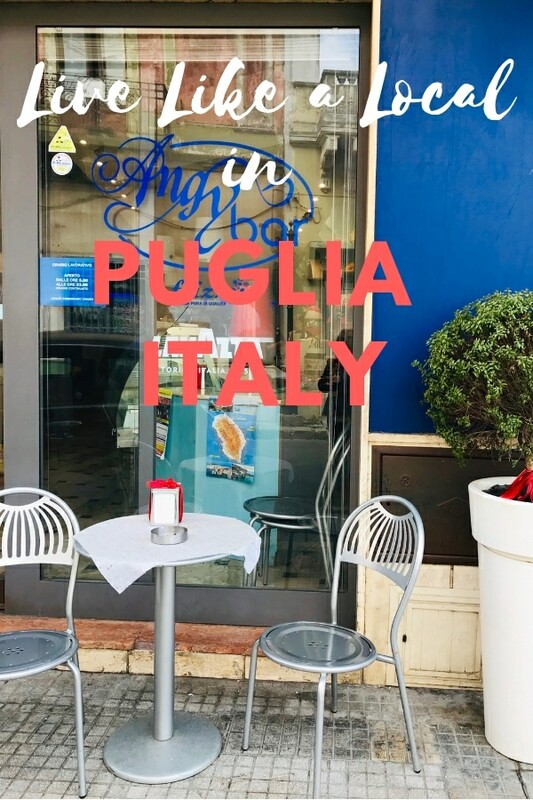 Puglia’s name derives from the Latin phrase a pluvia, meaning ‘without rain’ and the peninsula’s dry landscape is dotted with 500-year old olive groves, underground olive oil presses carved into the soft limestone, and towering cactus. Tip: Wondering how to pronounce Puglia? The pronunciation is “Pool-ya” and in Italian it’s Apulia. It’s an area that’s been invaded, conquered and populated by waves of Greeks, Romans, Ottomans, Spanish and Normans. Each left their mark on its traditions, architecture and landscape. This is good news for food and wine lovers. One of the best places to explore the wines within the Unione dei Comuni Jonica-Salentina is in the town of Melissano, named after the Greek word Melissos in reference to its honey production. This sweet legacy can be seen in the honey bee depicted within the town’s crest. More history can be seen within the Church of the Virgin of Rosary, home to several fine examples of cartapesta religious figures. These figures of finely crafted papier-mâché were popular as they could be created quickly, were light enough to be carried in processions and were much cheaper to produce than in marble. 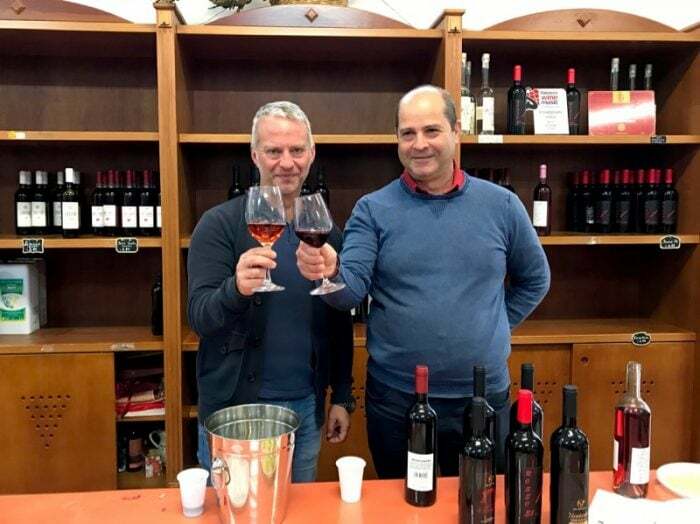 Wine fans will be interested in the Unione Agricola di Melissano, a cooperative producing Negroamaro, ruby red wine with rich black fruit flavours, as well as the medium bodied Primitivo, one of the most iconic wines of the Salento. 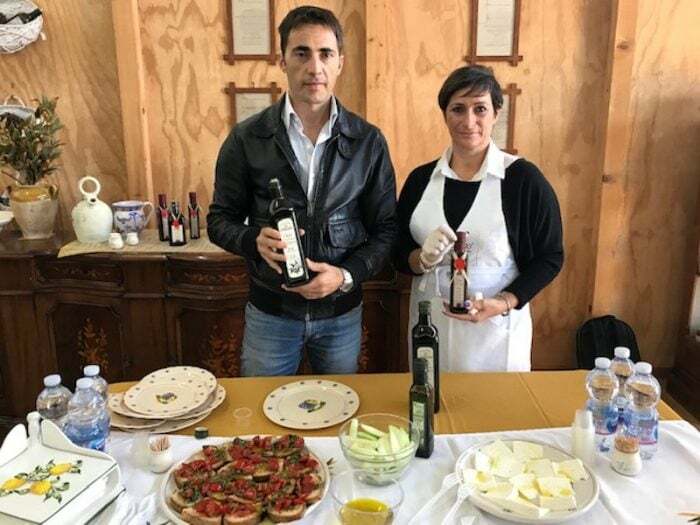 Sample these wines and authentic regional dishes such as pure di fave con cicorie (fava beans with chicory) at La Grottella on the outskirts of Melissano. This unique pizzeria and trattoria is home to one of more than 100 underground olive oil mills in the region. 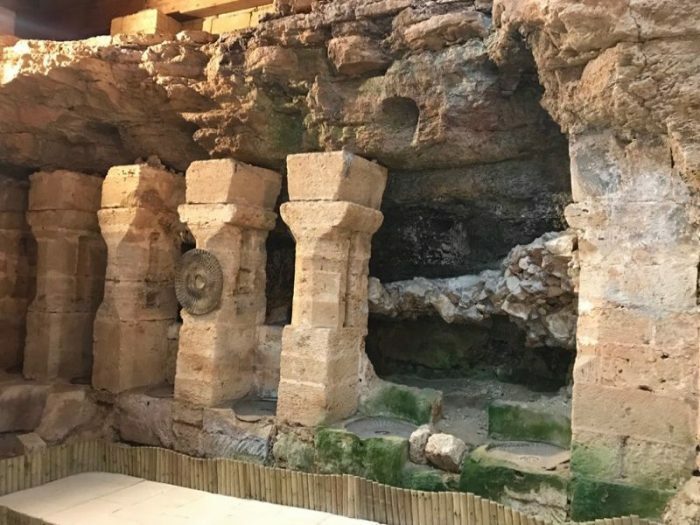 The underground facilities protected the olives from the scorching heat as well as from theft. At La Grotella, the ancient frantoi ipogei with its oil presses has been carefully restored. I was surprised to learn that olive oil was not only enjoyed as the deliciously healthy oil we know today but was once used for heating and lighting in the lamps throughout Europe. Another prime destination to use as a base in Puglia is Racale. This charming town is the type of place where it doesn’t take long to begin wondering about the price of real estate. It’s easy to imagine oneself cycling to the market or hanging laundry on a light-flooded rooftop of a 17th century building. This small, inland village brims with unassuming genuineness; its cobbled streets empty except for cascading flowers and palazzos waiting for a breath of new life. 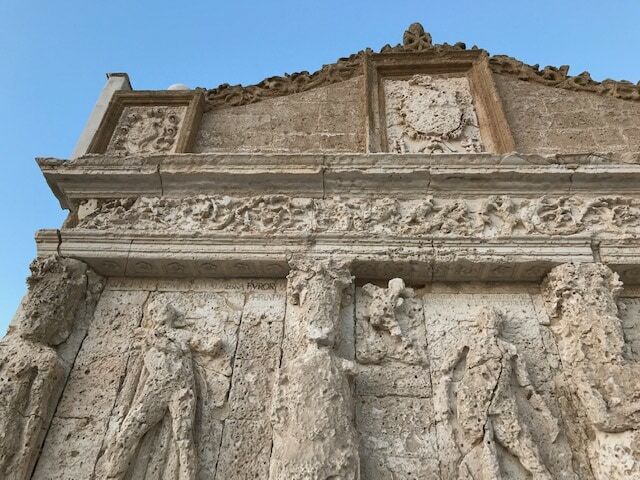 In addition to a rich history evident from the she-wolf of Rome emblems on its fountains, ancient city gates and 600-year old stone walls, the town of Racale is just a 10 minute drive to soft golden sand beaches stretching northward to Gallipoli. Fringed by a national park filled with fragrant Aleppo pine, the windswept dunes and azure waters are assuredly some of Italy’s most scenic. While summers are busy with locals who flock to the seashore’s beaches, the shoulder seasons of spring and fall see few visitors. It’s also proving to be a popular retirement destination in Italy. 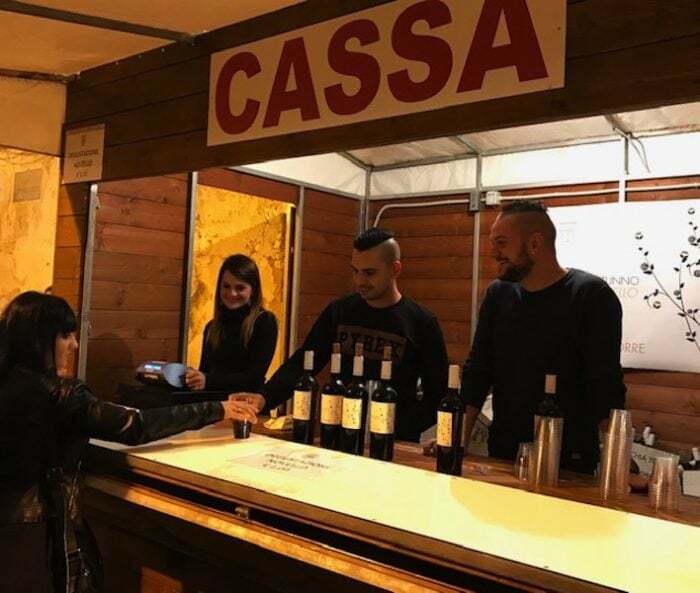 With real estate said to be half the price of Tuscany, Racale is a short drive to beaches and features outdoor markets filled with fresh produce, antipasti and local cheese. 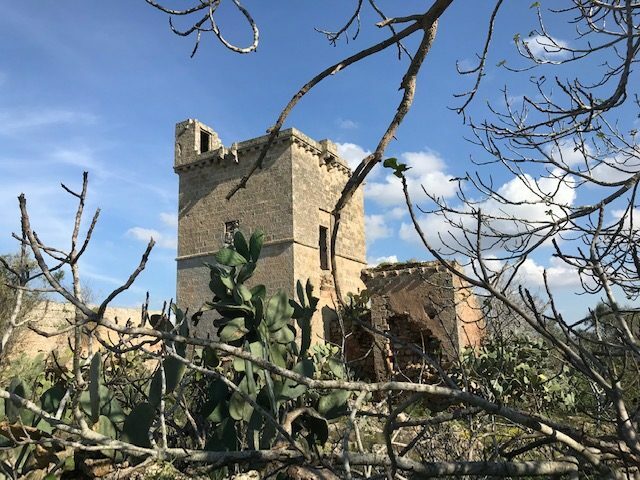 The surrounding countryside is dotted with wild flowers, cactus, ancient gnarled olive trees and even more frantoi ipogei in various states of restoration. An outside table at stylish Solatio restaurant near Torre Suda is a prime place to soak up the views while dining on sweet shrimp simply grilled with olive oil, lemon and sea salt. This tiny town is best known as the home of the Festival de San Martino (St. Martin of Tours), an autumn harvest celebration recognizing the patron saint of winemaking, horsemen and horses, beggars, the poor and injured. San Martino is often depicted on horseback, sharing his cloak with a beggar. His feast day is November 11th but if you’re planning to attend the festivities in Taviano, it’s important to note that the festivities take place on November 10th. 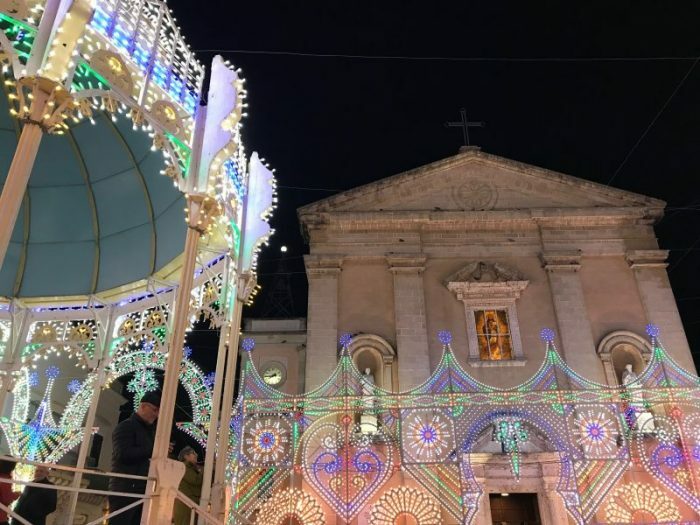 They include the illumination of the streets of the town, processions featuring the statue of the St. Martin being carried from the church through the streets along with brass bands, live music and dance. And of course there’s food, food, food. 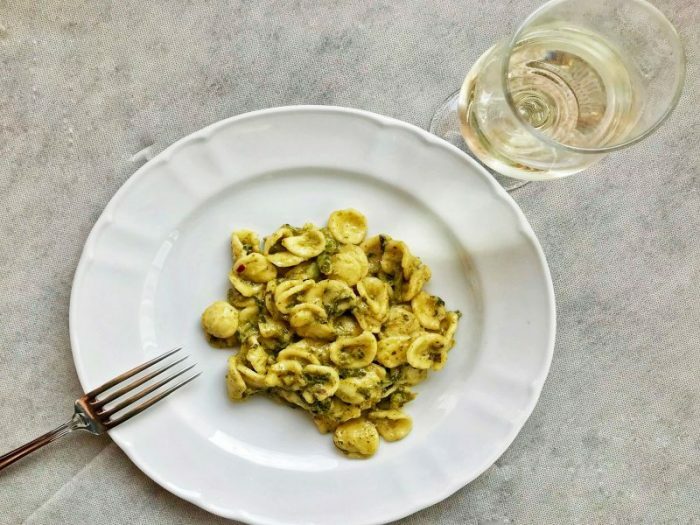 When it comes to cuisine, in addition to celebrating with vino novello (new wine of the season) and castagne (chestnuts), food fans will enjoy sampling regional dishes such as orecchiette, an ear-shaped pasta originating in this region of Puglia as well as artisanal dishes such as Scapece Gallipolina, tiny fish such as fried smelt marinated in vinegar, olive oil, saffron and grated breadcrumbs. 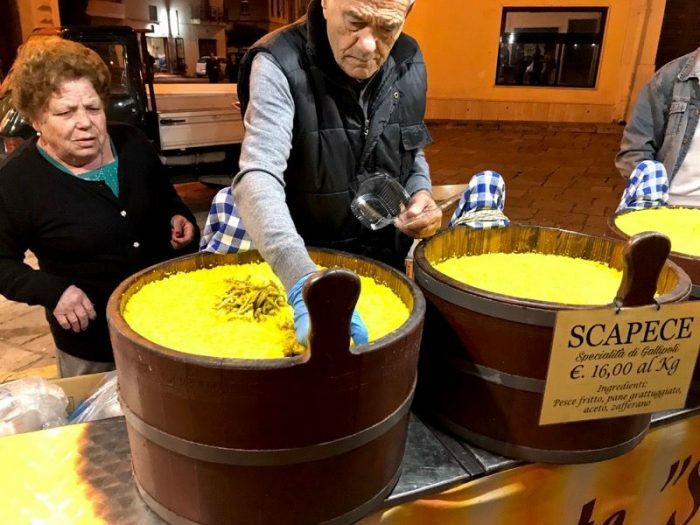 Produced by a small number of families, who themselves are descended from generations of scapeciari dating back to possibly even Roman time, scapece is sold exclusively in markets and during festivals in the Salento region. Look for enormous wooden barrels and order a serving by weight from the vendor for a few euros. The dish reminded me of fish escabeche in Spain and Latin America but for me, scapece would be an acquired taste. 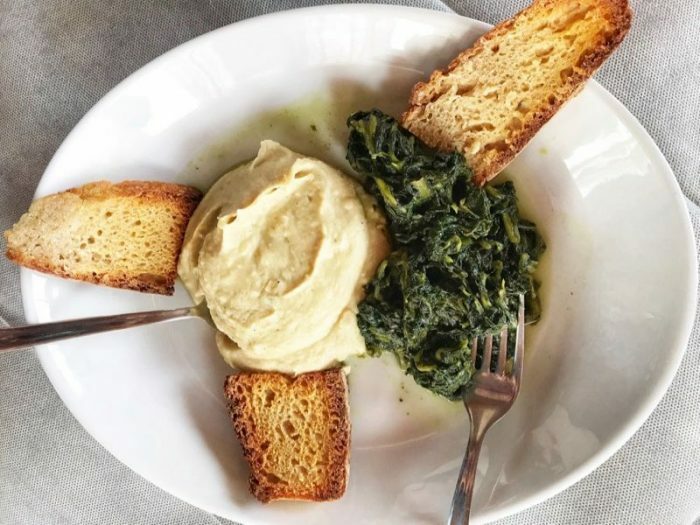 Another regional dish popular throughout Salento — Purè di fave con cicoria or Fava Bean Purée with Chicory– had me swooning at first bite. Perfect in its simplicity, much like other cucina povera style recipes of Puglia, it’s a marriage of creamy fava beans complemented by slightly bitter chicory. I ordered this magical, leafy vegetable dish (which also happens to be vegan and gluten-free) whenever I could. 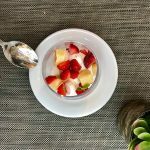 Sign up for the free A Taste for Travel newsletter and you’ll get an authentic recipe for fave e cicoria in our next newsletter! 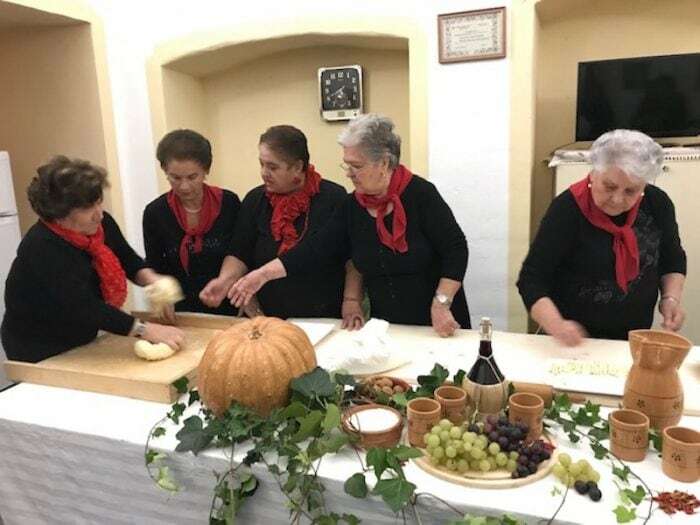 As you explore other inland towns in Salento, you’ll meet vendors in markets, chefs as well as artisanal producers, all willing to share their stories and cuisine. The cucina povera tradition means the cuisine is simple and delicious, relying on fresh, local produce. Begin with an exploration of extra-virgin olive oil production of ulivi secolari, centuries-old olive trees. For a tutored tasting, visit the Adamo Estate in Alliste where they cultivate without the use of pesticides or fertilizers. The prized olives are harvested in early October and then crushed using a traditional mill, thus preserving the quality and fruity flavour of this superb olive oil. 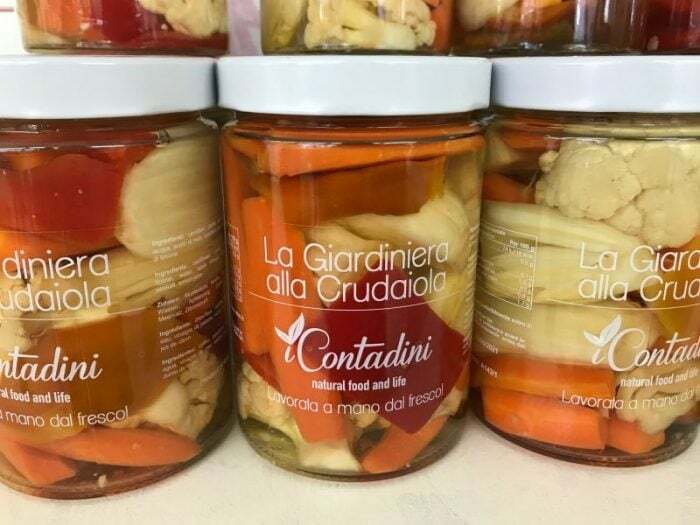 Another must-visit is the pastoral Contadini farm in Felline where you can sample an award-winning line of products such as sun-dried tomatoes, marinated vegetables and oils in a rainbow of colours. Don’t miss enjoying a leisurely lunch at one of the seafood restaurants such as Trattoria Octopus in Alliste where antipasti include polpette di polpo followed by catch of the day, baked in a sea salt crust, a regional method of cooking that deliciously preserves the freshness of the fish. Wrap up your explorations in Matino, a charming village of winding streets, courtyards and stacked stone houses known as casa in corte, many of which have been converted into stylish B&Bs. 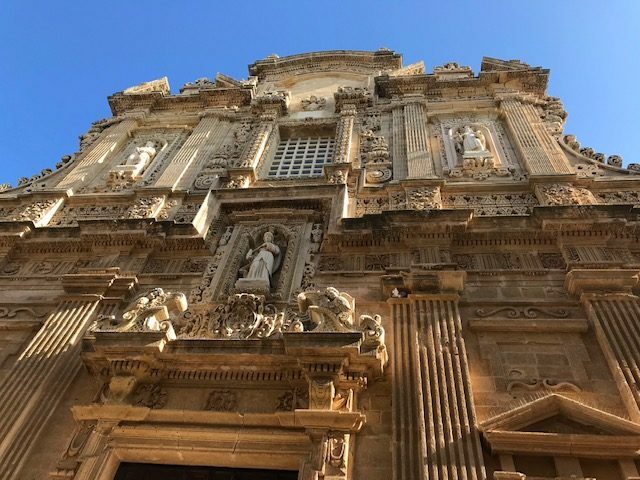 Although Matino is a quaint destination filled with fairytale, white-washed buildings and frescoes, it has a youthful energy and creative spirit. 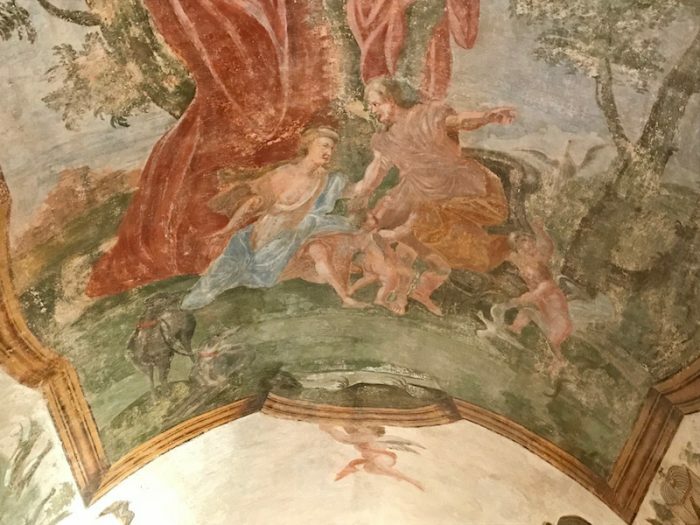 Located within the historic Palazzo Marchesale, its modern Museo Arte Contemporanea Matino is home to an expansive collection of contemporary art well worth exploring. Don’t miss dining at the atmospheric Trattoria Vinha’ located within a restored historic olive oil facility. They generously provided us with a recipe that we’ll feature in our next newsletter along with more about their cuisine. While in Salento, you’ll likely have an opportunity to witness the traditional folk dance the pizzica. While it has its origins in the Tarantella dance (a frenzied dance said to have been performed by victims of those bitten by a tarantula in order to sweat out the effects of the venom) the pizzica is a more elegant, romantic dance. It’s often performed on the street by a couple accompanied by a guitar, a mandolin, an accordion and tambourines or more simply by tambourines and chanting. 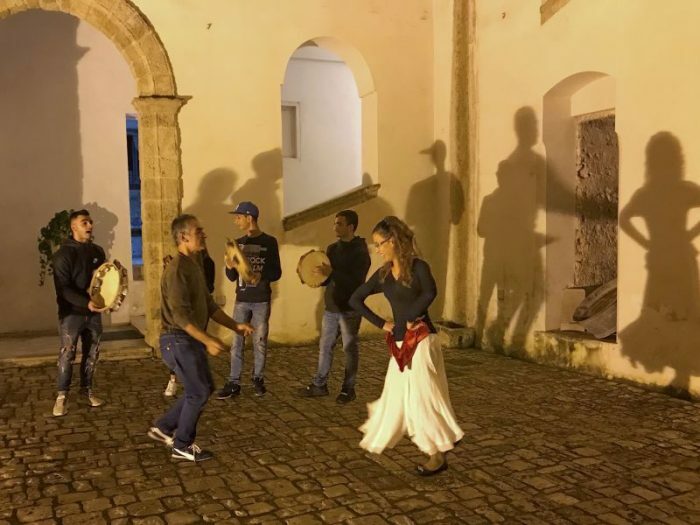 Even Madonna danced the pizzica while in the Salento on vacation. She’s missing a dance partner in the video below but the music is definitely contagious! Situated on the west coast of the Salento Peninsula, facing the Ionian Sea, Gallipoli makes a fine base for explorations. While much larger than the Unione dei Comuni Jonica-Salentina group of villages, it offers a wealth of infrastructure in its Old Town and New City sections. Narrow streets, lined with graceful Baroque buildings in pale pink, yellow and white, lead to a seaside promenade, a sandy crescent of beach and a 13th century castle. 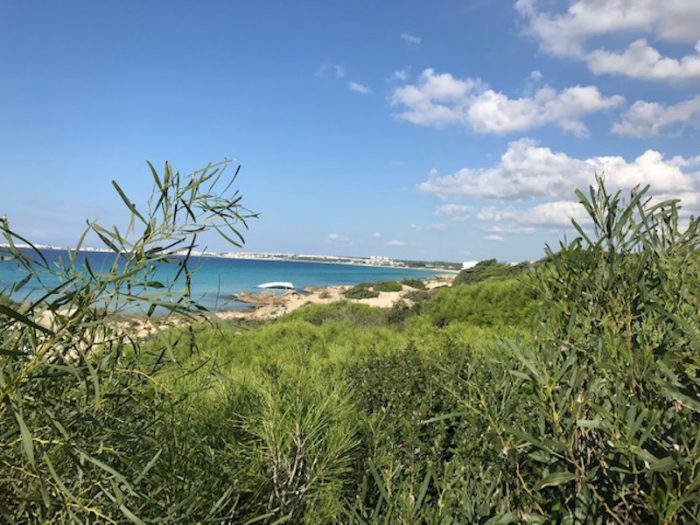 If you love being close to the sea or are wondering where to stay in Puglia without a car, Gallipoli makes a good base as you can get around by foot, by bus and on organized tours. 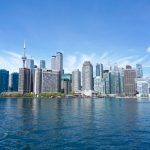 However, it’s much larger than the inland towns and is busier, has a lively (some say wild) nightlife and does see crowds of tour groups so that’s worth keeping in mind. Further north of Gallipoli is the town of Leverano, inland from the Gulf of Taranto coastline. Although not officially part of the Unione dei Comuni Jonica-Salentina, highlights here include the impressive Torre Federiciana dating to 1220. Time your visit for one of its celebrations of gastronomy and culture such as the Novello in Festa (New Wine Festival in November) or its summer Medieval Festival. 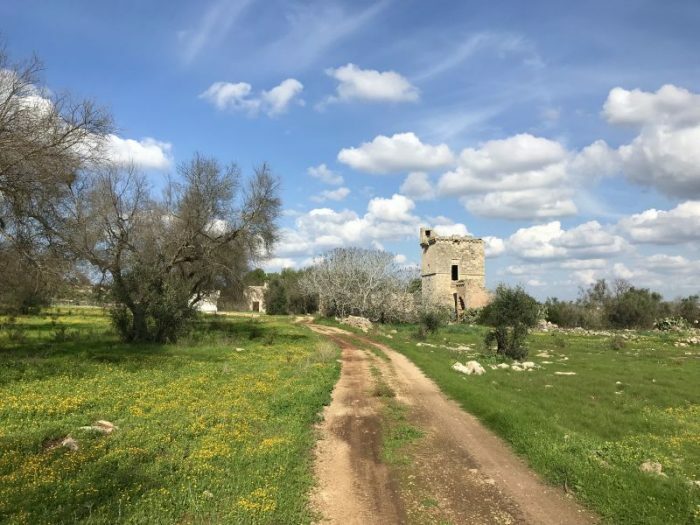 I suspect that exploring the villages of the Unione dei Comuni Jonica-Salentina is just the beginning of the many things to do on the Salento Peninsula. 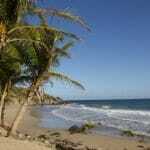 Head further south and you’ll discover even more beaches, fine cuisine and fascinating culture. Sounds as though I’m ready for a return trip. This post contains affiliate links. Read our Disclosure page for details. Best Time to Visit Puglia: Visit the Salento region in the shoulder seasons of spring or fall. June, July and August are the driest months but are also the busiest. December and January can actually be chilly with daytime highs of just 13-15 C and overnight lows of 7 C. Ideal months are May or September. November sees more rainfall but is also the time for many harvest festivals such as the Festival of San Martino in Taviano so is worth it if you’re not planning on swimming. Where to Stay in Puglia: There are many small B&Bs as well as listings on AirBnB. If you’re accustomed to the steep prices in other regions of Italy, you’ll be pleased to discover that prices are as low as 35 Euros a night ranging to a high of 100 Euros in the small AirBnBs and apartments. The largest selection of these historic homes converted to accommodation for visitors is in Matino. One particularly charming apartment I inspected (and longed to call home) was B&B Corte Dragone and featured three apartments at astonishingly low rates. Due to the time of year I visited (mid-late November) and a busy schedule, I stayed at the Bellavista Club, a member of the Caroli Hotels Collection, in Gallipoli. While the large, modern hotel has some advantages, namely spectacular views and an English-speaking, helpful staff, the guest rooms could use refreshening. Check here for prices on the Bellavista Club in Gallipoli. Getting To Brindisi: Fly to Rome and then take a short connecting flight to Brindisi via Alitalia or travel by train in five hours. You can also fly to Zurich and fly to Brindisi. Rome to Brindisi Train: You can travel from Rome to Brindisi by rail in around three hours. Overnight in Rome: If you’re staying in Rome enroute to Puglia, it’s worth staying near the Stazione Centrale Roma Termini for easy access to rail and the airport as well as attractions. Check out our Guide to Rome’s Termini Neighbourhood for tips on where to stay, what to eat and things to do. It’s also possible to take the ferry from Greece to Brindisi. 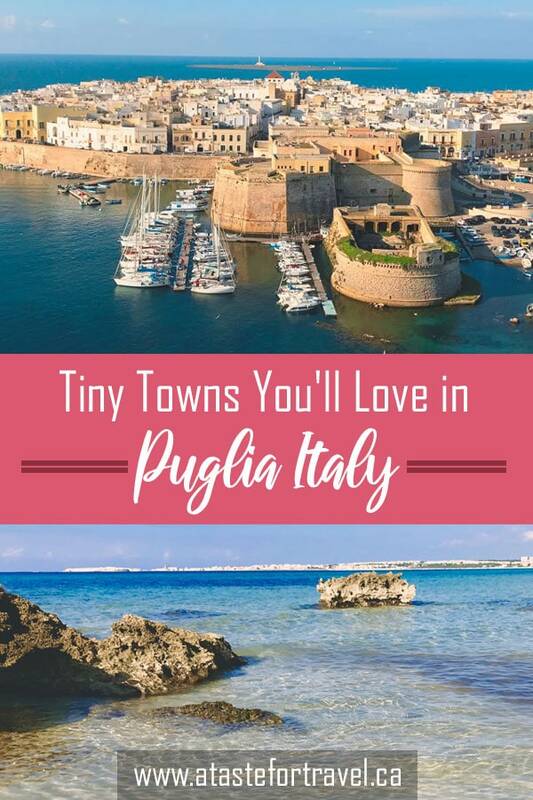 Very enticing and thorough guide to Puglia, a region I’ve yet to explore! The fava bean puree and chicory looks delicious, as does the light on the ancient walls and harbour. Stand by for the recipe for the fava bean puree with chicory! It was delicious! Looks like it’s worth traveling to just for the orechiette! I believe I was on the Costa Jonica as a chid but don’t remember much. Looks like a great place to get away from crowds–and get some great authentic food! Hopefully you’ll be back there in the near future! I didn’t know Italy had nice beaches so thanks for the info. Do you need a car to get from Gallipoli to a beach? I’ve only ever thought of Galipoli in terms of the Second wold war. Now curious and motivated to visit and explore the region. I think many people have only heard of Gallipoli Turkey and in relation to the battle in WWII but Gallipoli Italy is a completely different destination and well worth exploring! 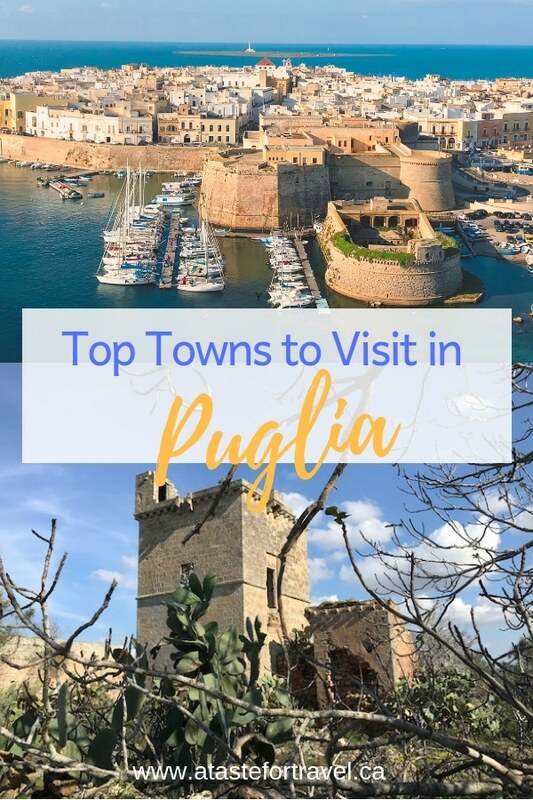 I hope to visit Italy for the first time this year and Puglia is definitely on my radar, along with Bologna, Rimini and Calabria. Last April we enjoyed touring the Amalfi Coast, Rome, Umbria, Tuscany, and Venezia. Thanks for introducing me to an entirely new to mean region of the country. Puglia looks like it has all the ingredients of a good place to visit: history, charm, and FOOD and wine. We are annual visitors to Italy and have been thinking about where next? Puglia keeps coming up and I think you’ve sealed the deal with this article, especially Scapece in Salento. The overview of regional foods and wine is excellent. Thank you and now book marked for future reference. 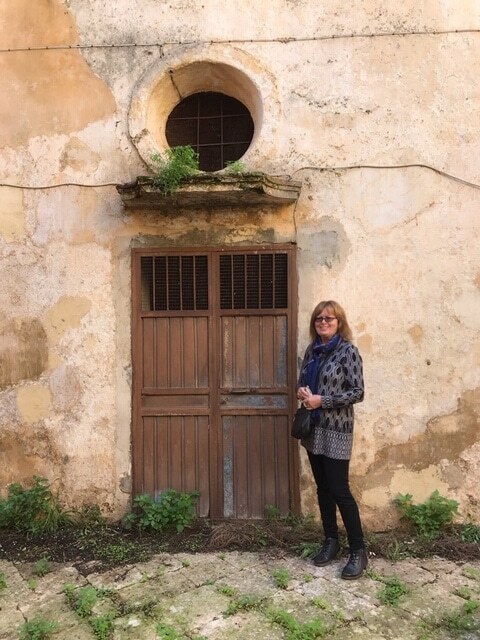 Thx for the super post about Puglia, Michele. I had no idea it was so close to Albania! Thanks for a very useful post (pinned!) So much of Italy suffers from over-tourism, it’s good to have some info for Puglia as an alternate way to experience authentic Italian life. What a wonderful place so full of history, good food, wine seasides and more . Great place Puglia is, Thanks for sharing such an amazing post and so beautiful images. Feeling like to go there as soon as possible. Keep up the good work. Cheers! !